The power swivel is one of the circle equipment during drilling and workover.Mainly used for connecting water hose and drilling pipe during drilling,for fluid circulation.Series of swivel mainly used for assorting drilling rig and workover rig,including regular,turnbuckle and power swivel three style.Reliable quality, strong commonality. •With standard lifting ring and double male buckle alloy steel subs. •Washpipe packing set assembly adopts cassette structure. 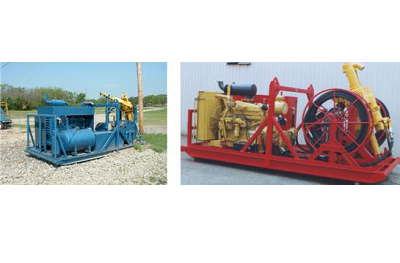 It can be exchanged quickly without disassemble rotary hose and gooseneck. •Through Hole at the top of gooseneck supply aisle for logging cable. •Standard gooseneck connectors.The screw thread compliance to API std 5B. •Swivel in accordance with API Spec 8 specification.API emblem is allowed.